I have been interested in Chinese mythology and arts for some time, and have been fortunate that my links to a martial arts school have generated quite a bit of illustration work over the years. So when the opportunity arose to review a book about the Chinese zodiac, I took it eagerly. 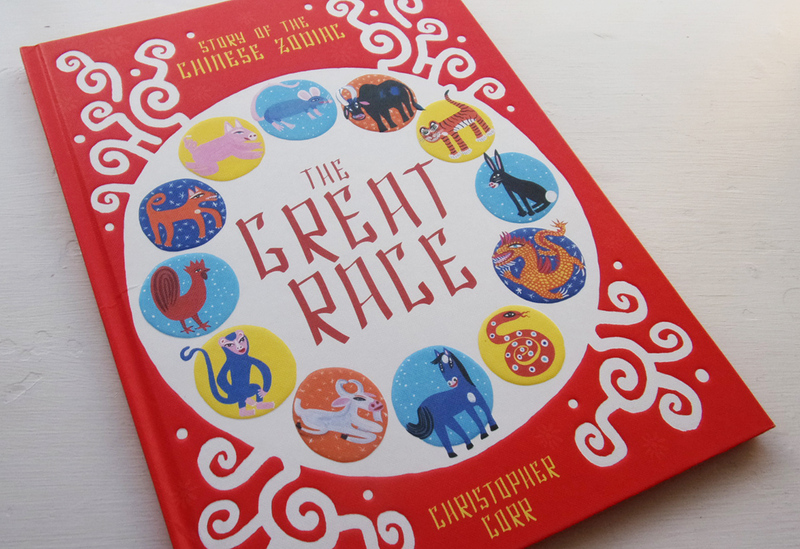 The Great Race is a retelling of a story from Chinese folklore, which explains why the twelve animals in the zodiac were chosen, and the reason for their order. This review will be far too long if I explain that sentence too much, so suffice to say that in the Chinese zodiac the year of your birth is assigned to an animal, there are twelve of them, and they keep cycling through in a set order. Rooster is followed by Dog which is followed by Pig, and so on. 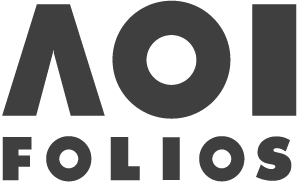 If you are interested then there are thousands of books and websites on the subject. 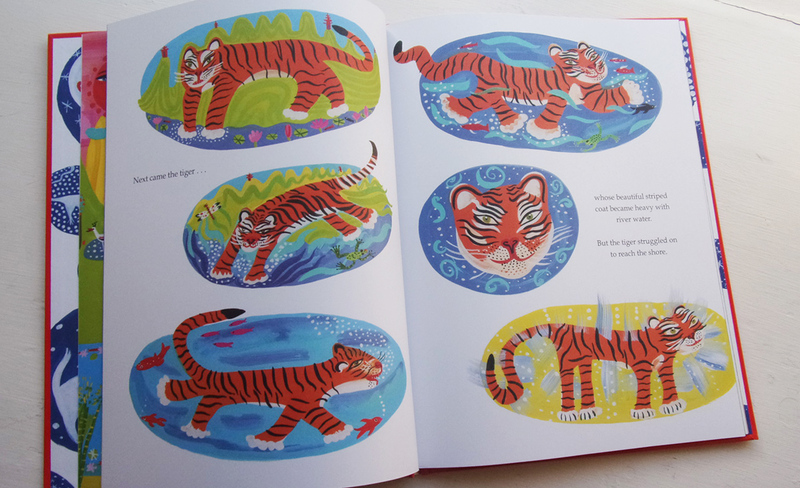 AOI member Christopher Corr has produced this latest iteration of the story as a children’s picture book for Frances Lincoln’s children’s book imprint within Quarto Knows. It is a hardback book measuring a pleasing 9 inches across and 12 down, with 36 pages, 34 of which are saturated with bright colour and imagery. Before we delve inside I have to mention the cover, the card of which has that tactile quality of textured hard cardboard in bright red, but the best part are the twelve animal images. They are each printed on raised disks within more relief patterns, which feel so cool under your fingers. What a beautiful way to begin a reading experience! Inside the artist tells the story of the great race with a bold and colourful style which I challenge any child to resist. If you had told me that Christopher Corr was in actual fact the alias for a talented group of primary school children who had created this with poster paints in their morning painting class, I would believe you. Now before anyone who knows the artist gets hot under the collar, let me explain that this is not a criticism. This is a compliment, as I reckon it is what he was aiming to achieve. 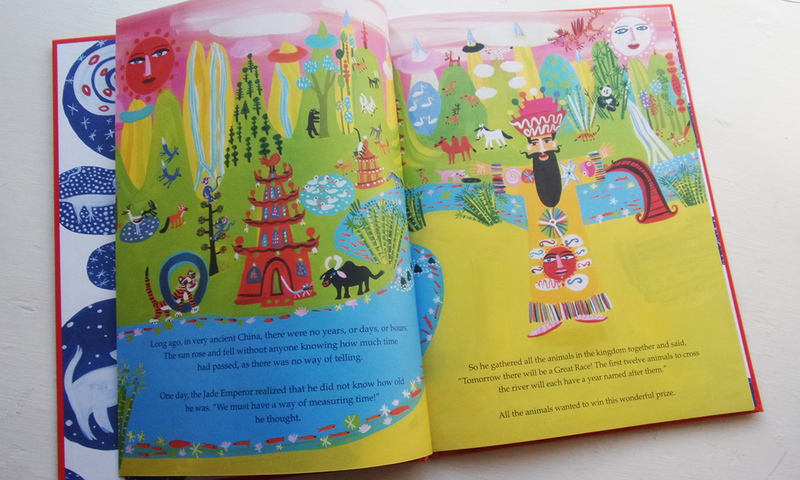 The shapes are child like and the colours are so bright you almost need sunglasses to read the book. Paint has been applied with such vigour that you can often see the brush marks in the colour, and it is this which I believe would appeal to children. I can imagine them being inspired to want to paint their own versions of the scene. Very clever, and you only need to study how these illustrations are composed and the colour choices to know the person painting them knows their illustrative stuff. I wouldn’t put them on my wall, but I admire their execution and fit with the subject and audience. 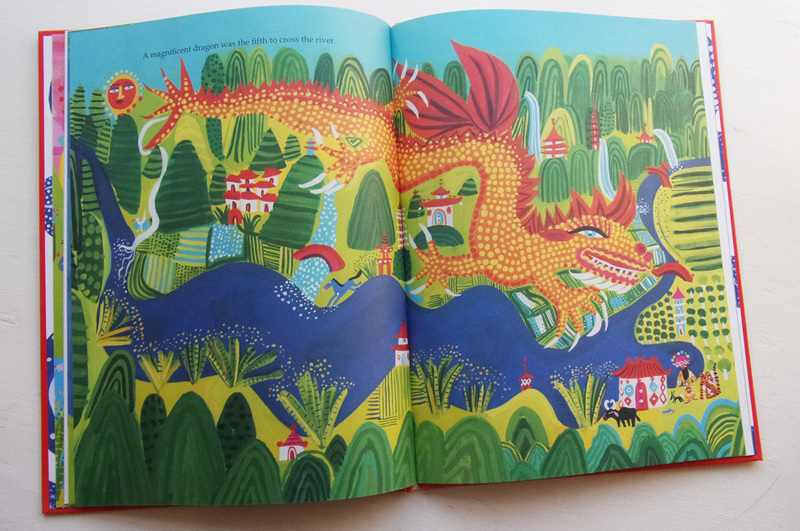 This book is beautifully crafted from cover to cover, and is a bright and energetic version of the old folk tale. I will definitely be looking forward to an opportunity to read it to one of my young nephews or my niece – they should thoroughly enjoy it.